Another favorite for birthday parties is the Chicken Cordon Bleu. It's a definite hit among guests, so we decided to share our own recipe. Are you ready to rustle up this sumptuous dish? 1. Combine softened butter and salt. Mix well. 2. Place a piece of chicken breast in a flat surface then brush the top with the butter-salt mixture. Sprinkle some freshly cracked pepper. 3. Top the chicken breast with ham slices followed by the sliced cheese. 4. Start rolling the chicken breast from one end to the other. Ensure that it is tightly rolled. You may use a toothpick to fasten the end of the chicken breast to keep it from rolling back. 5. After rolling the chicken, dredge or dip it in the flour. 6. Dip in the beaten egg and, lastly, to the bread crumbs. 7. Set aside for frying. 8. 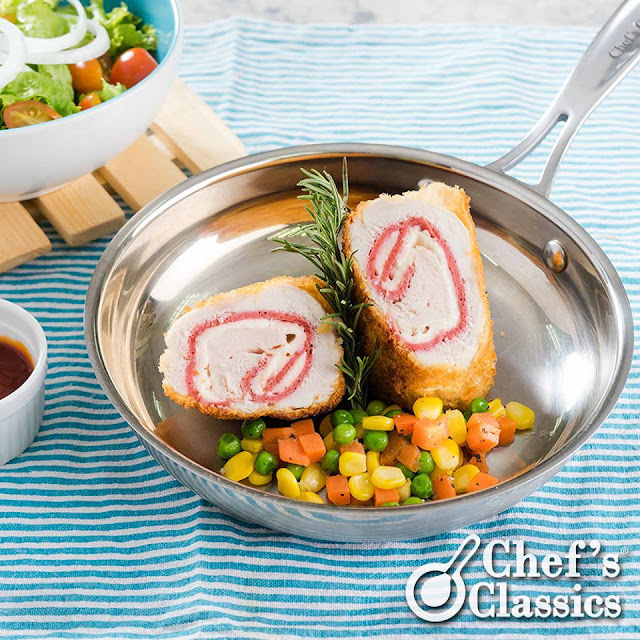 Heat cooking oil in the Chef's Classics Fennel Fry Pan, and fry each chicken roll until golden brown. 9. Serve with mayonnaise or catsup as dip.